As both a blogger and a barista, BBE 2014 winner Vincent gives us the lowdown on his local Malaysian coffee culture. With temperatures averaging between 28°C and 30°C year-round, it gets hot here in Malaysia…. really hot; which is one of the reasons why generally coffee shops here thrive. Spend a day exploring a city or village and you’ll find yourself in need some refreshment every hour and a half or so. That’s where our coffee shops come in. Three popular local coffee beverages in Malaysia. Now, as in most cities around the world, you can easily find your usual American coffee chains here in Malaysia, if such is your preference. But I’m not here to talk about any of those big boys; instead I’m going to introduce to you our local coffee scene. After all, isn’t travelling all about being a local in a foreign land – to eat what the locals eat and, likewise, drink what they drink? Now, imagine this; you walk into a local coffee shop here and ask for an iced latte. Chances are (and that’s a 100% chance) the owner – clad in a down-sized white singlet and donning Bruce Lee trousers – will be wondering what on earth this white man is talking about. You try again and ask for an iced coffee with milk. “What kind of milk?” is what you’ll likely get. What then should you do? Well, I’ll come to that in a bit, but first, a brief introduction of our local coffees. Unlike espresso-based beverages which are almost always made with premium Arabica beans, most Malaysians prefer their coffee (or as we say, “kopi”) brewed using robusta beans. These invariably carry a stronger, harsher taste – often with a grain-like overtone and “peanuty” aftertaste. Some might describe the taste as “musty”. Although robusta beans carry a higher caffeine content, they are generally inferior in quality compared to Arabica beans, which explains why a cup of kopi also costs substantially less than an American-chain coffee. Here, a generous 360ml serving typically costs between the equivalent of US$0.40 for a black and US$0.60 with milk added. Cheap, eh? Now, how should you order your coffee? Well, you’ll find that literally every coffee shop in Malaysia sells the three beverages I’m about to introduce to you here; such is their popularity. 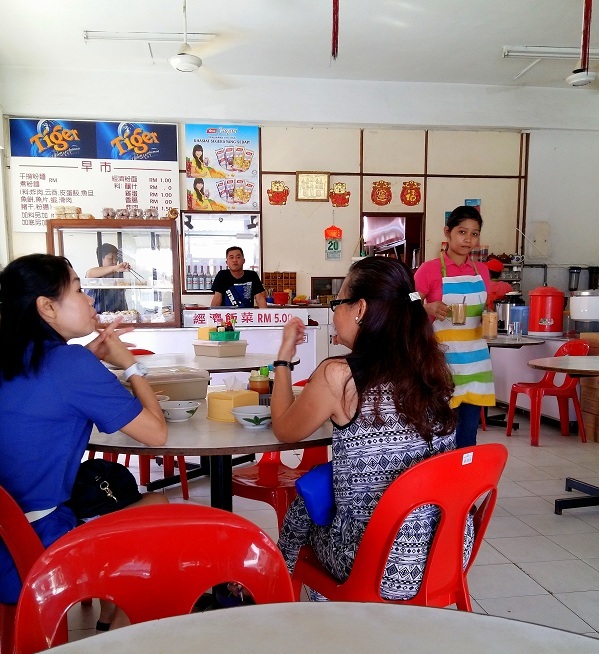 Speaking of coffee shops, here’s a picture of a typical traditional Malaysian coffee shop, or “kopitiam” as they’re affectionately known here (“tiam” being “shop” in some Chinese dialects). They may not be as well-appointed as your typical espresso bar but, with the right company, they’re just as great and cozy a place as any to hang out at. 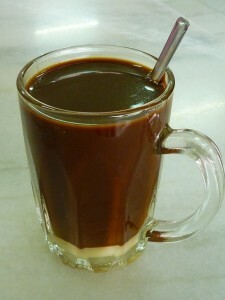 Kopi-O. This is a traditional coffee recipe commonly found and consumed in this part of the world. It is essentially strong, black coffee – hence the term “O” which means black in Chinese. What makes Kopi-O so agreeable to the palate is the ground coffee used to make the beverage; they’re actually processed from robusta coffee beans which have been roasted with butter and sugar – so you can imagine its heavenly aroma. The beverage is made by pouring piping hot water into a pitcher through a finely-meshed “sock” (which resembles a windsock) containing huge amounts of ground coffee. The coffee in the pitcher is then transferred into a cup or glass ready to be served. What Kopi-O lacks in giving its drinker that instant “wake-up call” like an espresso does, it more than makes up for by its divine taste (think butter!) and how very well it complements almost every kind of Malaysian fare, especially our varieties of local breakfasts. Kopi-O can be consumed either piping hot or ice-cold, in which case it’s called “Kopi-O Peng” (“peng” being “ice” in Chinese). Either way, a strong, well-concocted Kopi-O makes for a most satisfying all-day refreshment. 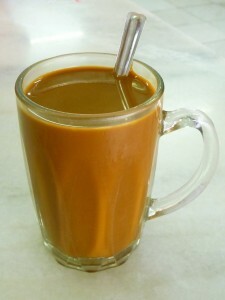 Kopi Nai (pronounced “nigh”, meaning “milk” in Chinese) – or just “kopi”in some parts – is very simply Kopi-O with sweetened condensed milk added. 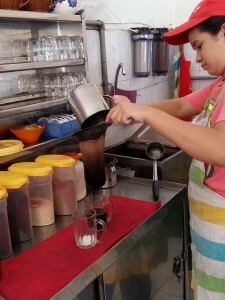 Although for me it’s “the more, the sweeter, the better”, fact is with health consciousness steadily on the rise in the country, many tend to order their Kopi Nai “less sweet” (i.e. with less sweetened milk) these days. To be honest, I feel this totally defeats the gist of ordering this beverage in the first place…. but that’s my personal opinion. 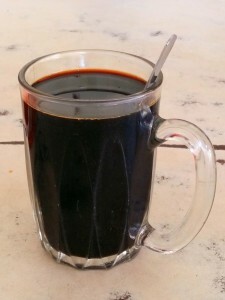 Like Kopi-O, Kopi Nai is excellent taken ice-cold (mention “Kopi Nai Peng”) and is a most welcome form of rehydration on a typically hot Malaysian day. Commonly consumed at breakfast, the beverage complements kaya (sweet coconut and egg jam) on toast particularly well and makes for a great “pick-me-upper” especially when prepared strong. Good stuff. Kopi-C. How this beverage came to be so-named, I haven’t the faintest idea (trust me, it’s not an alphabetical thing). What I cantell you though is that Kopi-C is basically Kopi-O with evaporated milk and sugar added. Made properly, this is a well-balanced coffee beverage which offers drinkers the pleasant combination of strong coffee and light milk. Compared to Kopi Nai, it’s “lighter” and (some say) smoother on the palate. Like its two cousins above, Kopi-C is equally good piping hot or ice-cold (again, just say “Kopi-C Peng”). So there you have it; three popular local coffee beverages which you’ll find at nearly every coffee shop in Malaysia. They’re inexpensive, immensely aromatic and offer a pleasant alternative to your usual espresso drinks. Do try them if you ever swing this way. So, will it be Kopi-O, Kopi Nai or Kopi-C for you? Either way, now you know how to get your caffeine fix and stay hydrated in sunny Malaysia. Book a hostel in Malaysia here. Thanks for the opportunity to guest-blog, HI. Looking forward to more.